I recently found a great book, 3 Minute Horsemanship by Vanessa Bee. I’ve begun using her lessons to develop a better relationship with my horse. Here is our story. I had insecurities before we even began. What would I do? What would Lexi do? Would we find the peaceful state suggested by Bee? Three minutes can seem like forever! Bee instructs you to sit or stand with your horse and to “empty your mind,” ignore the horse, and to be aware of your breathing and heartbeat. Peace will come. Knowing myself, I thought I’d look at Lexi and start thinking, “Oh, I should trim her bridle path or brush out her tail.” You know how it goes! Before I began the lesson I remembered a few things from past clinics I’ve attended. If a person projects an intension, it is often felt negatively by the horse, so I decided to use a few meditation-like techniques. I sat down. I softened my facial expression to a Mona Lisa smile, (like you’re thinking of something that quietly delights you). I either closed my eyes or gazed out in a Zen-like state–looking without thinking. I breathed deeply. I’ve read about how your breath affects your horse, so I decided in these three minutes to breath in harmony with Lexi. I watched her abdomen expand with her inhale. I watched her exhale by pushing the air up through the ribs and out. I tried to synchronize my breathing to be in rhythm with her, all the while keeping the soft expression and Mona Lisa smile. That took some concentration and focus; not once did I think about doing something else, and the three minutes passed quickly. What did Lexi do? 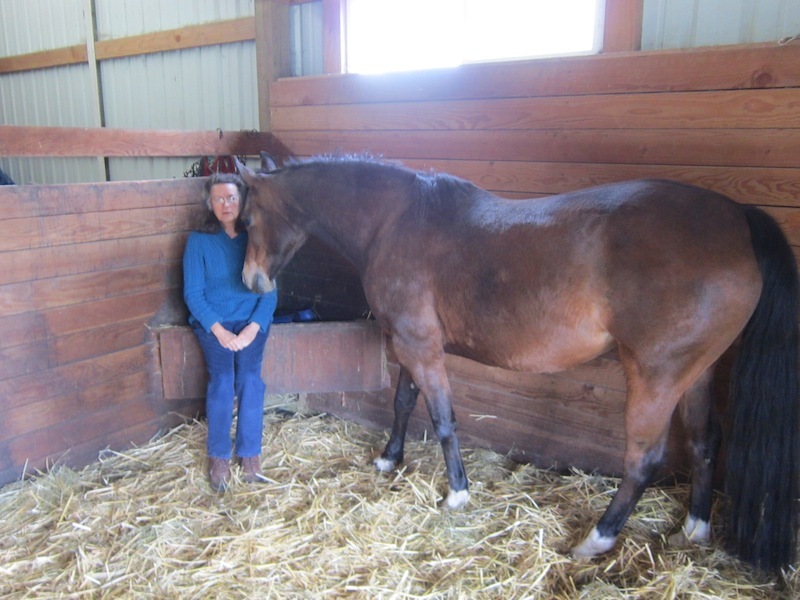 This first time I chose to keep her confined in her stall, as Bee suggests starting in a place where your horse appears most relaxed and comfortable while being free to move around as she usually does. I had no treats in my pockets. She investigated me first, nuzzling my hand and my cheek. I kept meditating–just deep breathing. She walked away to a corner, but then about ½-way through the lesson she came over and stood by me, with her head lowered. She even sighed and yawned like Bee mentions in the book. Awesome! We just hung out together. Next time I’ll try this in a more open area like her paddock or pasture. I wonder if she’ll walk away, or come over to hang out together and connect with me.